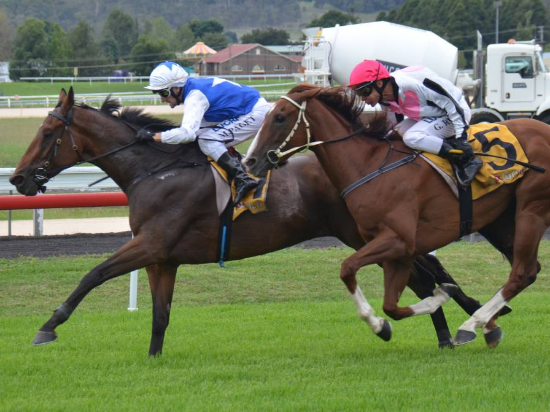 Kasharn ($11) debuted for his new Grafton stable by annexing Sunday’s $40,000 McDonald’s Armidale Cup (1900m). The Dwayne Schmidt-trained six-year-old arrived in Schmidt’s Grafton stable just a few weeks ago but didn’t waste any time in paying his way when he held off cup $4 favourite Loud Enough (George Woodward) for a half-length win. Backhouse Billy (trained by Jenny Graham, $19) was third while unlucky Carry On Jake (Paddy Cunningham, $4.80), who won last year’s Cup, was fourth. Schmidt, who jumped off an Armidale Cup winner (General Parker) to ride another horse when he was a jockey, admitted he didn’t know much about the gelding son of All American. He has had him a few weeks but said he had “blossomed at home the last week”. Matthew Paget rode Kasharn and followed instructions perfectly: “Good to win it for Dwayne,” Paget said. “We had to ride him cold today.” He said the “runs came for him” at the right time for him to claim his second Armidale Cup. Grafton trainer Greg Kilner also started the Cup day well when She’s Choosie won the first race with his daughter Leah aboard. Armidale trainers also had success with Frank Tanner winning with Freedom Park, and Paul Grills successful with Image Of Love. Glen Innes trainer Paddy Cunningham may have been unlucky in the Cup with Carry On Jake but he did manage to snag a double with Saint Element and Carry On Ringo. Tamworth trainers Zach Hatch (Schappose) and Craig Martin (Bullet Kid) also had winners, Martin winning the main support race, the $25,000 De Bortoli Wines 2018 David Dye Memorial Newmarket (1100m).